Tuesday, Nov. 3, 2009 at 9:42 p.m.
What was Chris Daggett’s impact on the election today? According to the New Jersey exit poll, he didn’t seem to develop a broad appeal with any particular constituency. Among independent voters, he garnered just 9% of the vote, and fared somewhat worse among partisan voters. His support was fairly similar among both men and women, all age groups, and across all regions of the state. The independent candidate’s bigger impact may be in where his support would have gone if he had not run for governor. 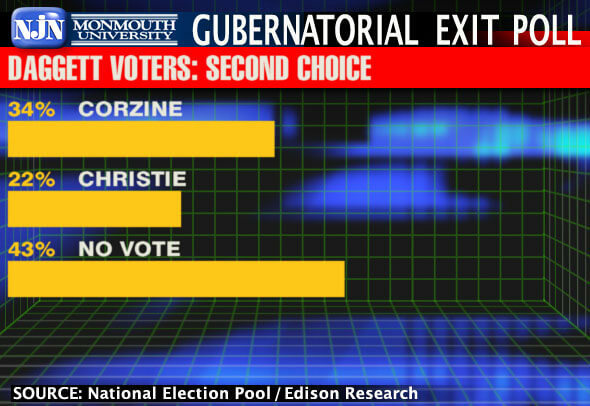 If their candidate’s name was not on the ballot, 34% of Daggett supporters said they would have voted for Democrat Jon Corzine, while just 22% would have voted for Republican Chris Christie. The remaining 43% claimed they would have stayed home if Daggett was not in the race. “Daggett’s presence in this campaign gave disgruntled voters another option, but few took it. Most pre-election polls showed him in the double digits. It turns out he didn’t perform nearly as well and had little impact on the eventual outcome,” said Patrick Murray, director of the Monmouth University Polling Institute and exit polling analyst for NJN News and Gannett New Jersey.